Last night’s episode of 24 was excellent. No surprise there, really. I mean, a bad episode of 24 is like a hamburger without beef. 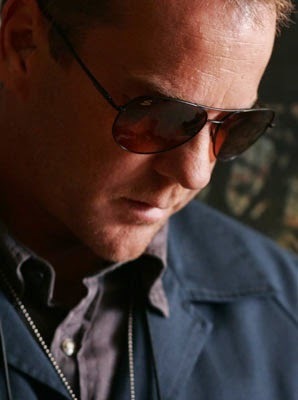 Jack Bauer has to be one of the most amazing TV characters of all time. His prowess never fails to bring a smile to my face. He is an absolute thrill to watch. In the spirit of Jack Bauer Appreciation Day (which is a recurring holiday—every Tuesday, in fact), below are some entertaining Jack Bauer sayings I recently discovered. Enjoy! Jack Bauer never retreats, he just attacks in the opposite direction. On Jack Bauer’s Tax Returns, he has to claim the entire world as his dependents. Some people see the glass as half full. Others see it as half empty. Jack Bauer sees the glass as a deadly weapon. When bad things happen to good people, it’s probably fate. When bad things happen to bad people, it’s probably Jack Bauer. Jack Bauer once arm-wrestled Superman. The stipulations were the loser had to wear his underwear on the outside of his pants. If you’re holding a gun to Jack Bauer’s head, don’t count to three before you shoot. Count to 10. That way, you get to live 7 seconds longer. “You don’t know Jack” is a blessing among terrorists. American Idol is popular only because it has a commercial for 24. The Berlin Wall fell because Jack Bauer needed to get to the other side. If Jack Bauer shot you while quail hunting, it wouldn’t be an accident. When car-pooling with Jack, never yell shotgun. There are three leading causes of death among terrorists. The first two are Jack Bauer, and the third one is heart attack from hearing Jack Bauer is coming for them. a bad episode of 24 is like a hamburger without beef. I was very pleased with last night's episode. You know they also have these sayings for Chuck Norris. I'm not saying that Jack Bauer had to steal smart sayings from Chuck Norris...I'm not saying that...but I am a member of the "Walker, Texas Ranger: Master of the slow-motion round-house kick" group on facebook. Jack Bauer never steals. Chuck Norris gave him the rights to those sayings a long time ago. Even Chuck Norris knows when he's beat.